HOIMA– Hoima and Kikuube districts continue to receive hundreds of Congolese nationals fleeing from fighting that has ravaged Eastern Democratic Republic of Congo (DRC). According to the Buseruka sub-county district councilor Godfrey Komakech, the incoming refugees include those that had returned to DRC when fighting subsided around May this year. He said in his sub-county, they have received refugees from Joo, Muvarama and Njugu areas in Eastern DRC. They are reportedly fleeing from a tribal fight between the Bagegere and the Lendu, said the Hoima Resident District Commissioner (RDC) John Stephen Ekoom who chairs the district security committee. Measures have been put in place to screen the people who are entering into the country, he said. “We have ensured that the refugees are being received at gazetted centres where we screen them,” Ekoom said. The security officials are screening the entrants to ensure that combatants do not take advantage of the incoming refugees to infiltrate local communities. The refugees travel by canoe boats across Lake Albert before they are received at the various landing sites in Hoima and Kikuube districts. The refugees enter the country through Kaiso, Senjojo, Sebagoro, Kyehoro, and Nsonga landing sites. But the Hoima district disaster management committee which is working with officials from the Office of the Prime Minister and the United Nations High Commission for refugees are being registered from Sebagoro landing site where the Ugandan Government has set up a reception centre for refugees. The refugees include some Alurs, Bagegere and Lendu and Hema. The Congolese claim there are also militia clashes with DRC government forces under the Ishasha cluster in the Eastern DRC. 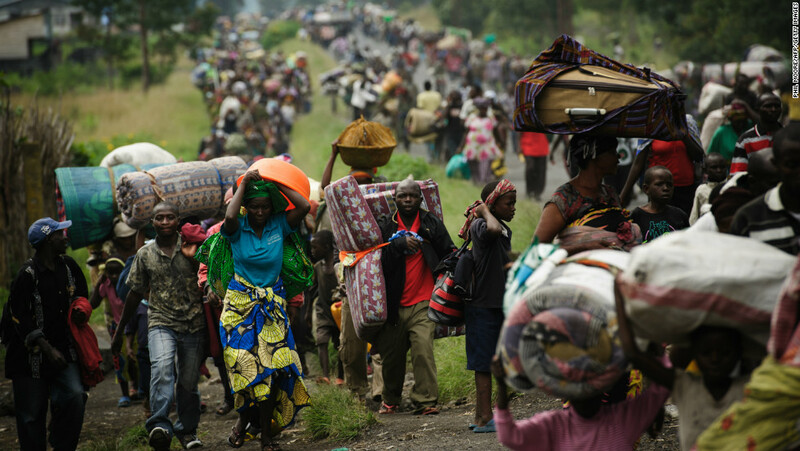 The new arrivals, mostly women and children, are reportedly fleeing inter-communal violence at Djugu territory in the DRC. The refugees have told Ugandan authorities that their houses are being scorched in the area and people are being attacked with machetes and firearms. Upon arrival, the refugees are given basic relief assistance before being transported by United Nations High Commission for Refugees (UNHCR) to Kyangwali refugee settlement camp. The refugees are being registered by OPM and medically screened by Action Africa Help, Government officials said. Since December 19, 2017, we have registered 54,872 Congolese refugees but there are others who continue to arrive daily” said Jolly Kebirungi, the Kyangwali settlement commandant. On average, every week, Kyangwali refugee settlement receives over 100 Congolese refugees. OPM and UNHCR are using buses to transport the refugees from reception sites on Lake Albert to Kyangwali refugee resettlement scheme. Medical officials screen whoever enters Uganda. “We are screening them for measles and Ebola. We have so far confirmed eight cases of measles among the people we have screened” said Dr Nicholas Kwikiriza, the Kikuube district health officer. The World Health Organisation recently confirmed the outbreak of Ebola in Eastern DRC. The screening centres have been set up at Buhuka and Sebagoro landing sites. The medics are reportedly screening incoming refugees and businessmen who are crossing the Uganda-DRC boarder for trade.